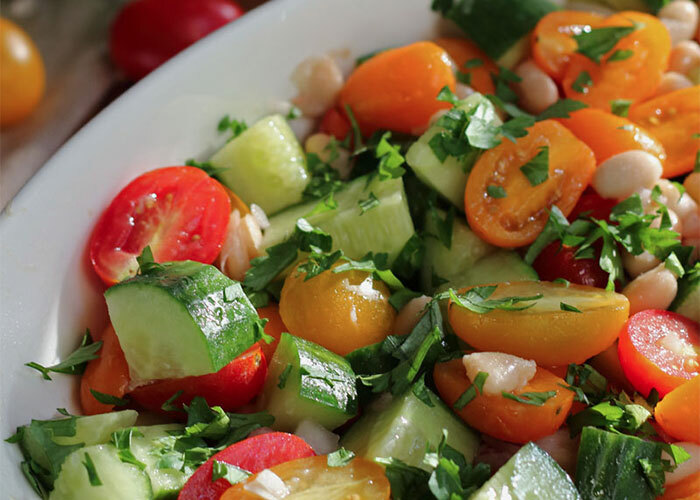 Cucumber Tomato Salad is crisp and crunchy, thanks to our greenhouse-grown cucumbers, and bursting with flavors from tomatoes, fresh parsley and seasonings. Substitute any of our small tomato varieties for our cherry tomatoes based on preference. In a large bowl, mix tomatoes, onion, cucumber, beans and parsley. Whisk olive oil, white wine vinegar, garlic and salt until emulsified. Pour over the tomato mixture. And stir gently. Allow the salad to marinate for 30 minutes and serve cold or at room temperature. Cucumber-avocado rolls are cool, crispy and refreshing! Be sure to serve this eye-catching treats immediately for best flavor and texture. Burritos are a great way to pack a delicious breakfast in a compact way. The perfect meal for those on the go mornings. This Baja Burrito gives your breakfast some added flare.